A year ago I wrote a blog entitled "How do I improve my photography" in which I discussed the idea of joining a photo group in order to gain experience and step outside your box to try new things, meet helpful people and learn more about photography. One of the funnest photo groups I belong to is the ProvoCreative Models/Photographers Group. This group, led by Pete Hansen, consists of a wide range of experience in both the models and the photographers and gets together at least once a month. These meets are generally intended as a great opportunity for networking (photog to photog, model to model or model to photog). Plus, it's a great way to get to know each other in a photographic setting which allows for learning techniques from experienced photographers, sharing what you've already learned with other photographers and meeting models who may be beneficial to your goals, etc. Working with a model allows me to experiment with photographic styles or techniques that I might be afraid to try "for the first time" with a paying customer. So while I'm a little more conservative with a paying customer (knowing that I need to guarantee a set of useful images), I'm a lot more "out there" trying something I've never done before with a model. Working with a model generally means that I can concentrate more on the photography and worry less about poses. That's not always true - some models are a lot more experienced than others. But with a good model I can spend a lot more time thinking about angles, lighting, composition and technique. On the other hand, it's also a great time to work on poses because, again, there is no pressure from a paying customer to deliver. So I feel greater freedom to experiment and try new things. I also love to share what I know. My philosophy is that "What goes around comes around." And so by helping others, I figure we all benefit. And one of the biggest reasons I love working with this group is the opportunity to visit new places, to try them out and see what it is like to shoot there. I may bring a paying customer back to the same location later based on my experience from the group. 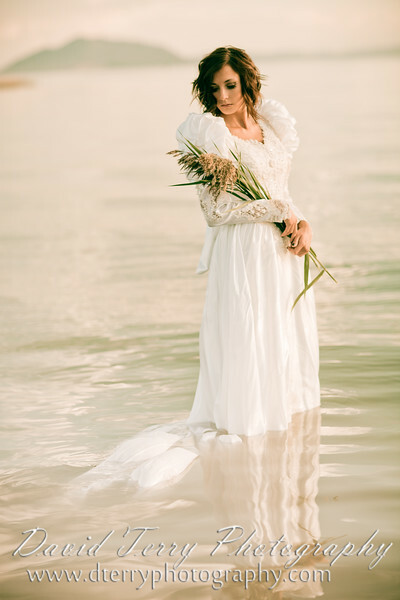 This past week I had the opportunity to go to Utah Lake with the ProvoCreative Models/Photographers group for a Trash the Dress/Suit photo session. I've blogged about this subject before. 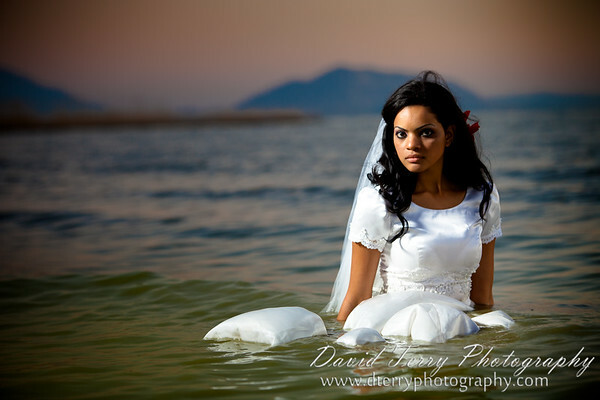 My first Trash the Dress photo shoot was a little over 2 years ago with Heidi (a friend/co-worker) who volunteered to go to the Great Salt Lake and be photographed by over 50 photographers. More recently, I talked one of my co-workers, Tyler Willey, into helping out with a Couple's session (he in a suit and Carolina Castillo in a wedding dress). We went to the Grotto (up Mt. Nebo Loop near Payson) for these pictures, which is the same location where I shot Laura just a few weeks prior. Photographers and models alike should realize that these meets are NOT about getting the perfect picture or building your portfolio. Why? (you ask in shock) Because the situation is not ideal. With 50 photographers or models surrounding you it's hard to get the perfect shot without someone being in your frame. And with the model trying to pay attention to the other photographers, it's hard to coordinate the perfect pose, expression, composition or light. But as I mentioned above, what the meet is good for is networking, socializing, learning new techniques or new locations. Having just experienced a photo shoot at Utah Lake for the first time, I wanted to quickly return and try it on my own - in a more controlled situation where I could pay more attention to my model and my surroundings. I met beautiful Alyssa VanLeeuwen probably almost 2 years ago and had talked to her about doing a Trash the Dress photo session almost that long ago. Well, it finally came to pass yesterday! Photographers, please note: The above shot was done entirely "in camera". No special editing has been performed. The secret? A CTO Gel (orange colored gel) on my flash. With the CTO gel on the flash, and the flash lighting up Alyssa, I set my in-camera white balance to Tungsten to match the CTO gel. The camera is then subtracting orange from the scene - which makes Alyssa look normal and sends the already bluish colored background (which is not lit up by the flash) into a deep blue. At the last minute, we tried to find a Groom to model with Alyssa because I love couple's sessions (a natural extension of my wedding photography). But not having found someone in time, Pete volunteered to help out! Thanks Pete and Alyssa. And thank you ProvoCreative for the awesome opportunity to get together just two days prior to try out this wonderful location! 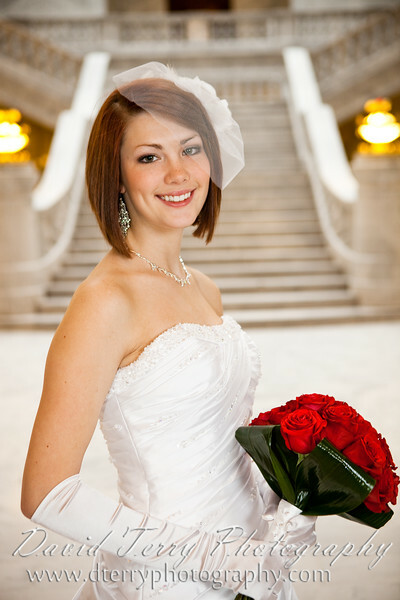 Emily is perhaps one of the prettiest brides I've had the honor of photographing. I was excited to find out she was pregnant and expecting soon. And now she's just about the prettiest mom-to-be that I've ever had the pleasure of photographing. I love maternity pictures. Mothers are so radiant at this time of their lives. What an honor to be able to record this for her and her husband to remember for years to come. I love the idea of Trash the Dress (using your wedding dress in ways you might not have dared prior to The Big Day). Read more about it here. 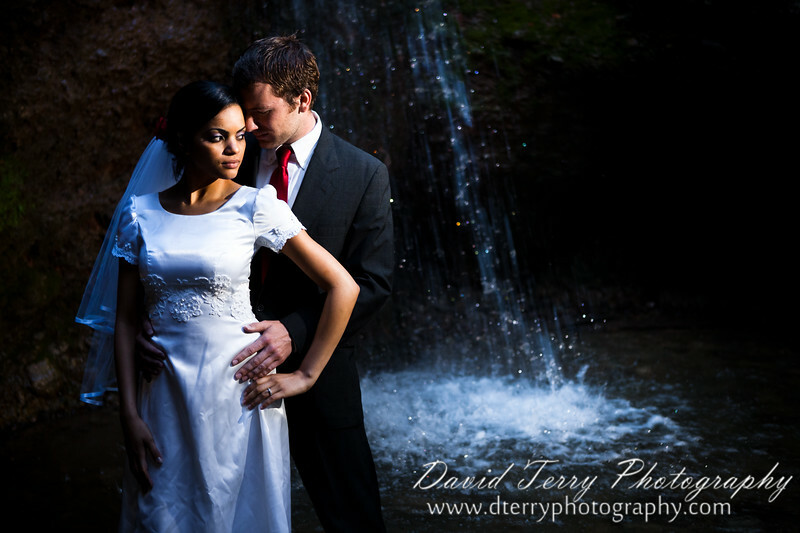 Carolina Castillo had arranged a male model / groom to be with her for a Trash the Dress AND Suit style photo session. I really wanted to do this and was looking forward to it. And then on the morning of the shoot, we found out that the male model had to cancel. So we quickly began the search for another model to step in and help out. With no male models available at such short notice, I asked a co-worker, Tyler Willey, if he'd be willing to wear a suit and get wet and ... hold a pretty girl in his arms doing it. I don't think it took even a split second for him to think about it. He said yes. And off we went. Less than an hour later he met Carolina for the first time. And less than an hour after that, we were shooting the following pictures. I had a lot of fun and they say they did too. Check out the pictures and let me know what you think. As an interesting side-note: Tyler and Carolina later got engaged (the proposal) and married.